The Katy Trail:The original application called for a 4' wide trail (based upon the $67K per mile constriction cost specified and requested). I was able to triple the trail's specified width and secure the necessary funding for the increased cost. The Pedestrian Bridge across White Rock Lake, and the 3/4 mile trail extension along the old landfill. I was also able to remove the singularly most dangerous trail segment in the state. The Multi-Purpose Trail under The High Five, connecting the White Rock Trail System with the Cottonwood Creek and Preston Ridge Trail: During the early phases of the High Five planning, I was able to show TxDOT that there was existing pedestrian traffic from Hamilton Park to the 7-11 store on the northwest quadrant. Utililizing provisions of the Sunset Review law existing at the time, I was able to force TxDOT to build the trail. The High Five really became the High Six, with the lowest being a bike-ped connection from the northwest to the southeast quadrants. Bike Racks in Oak Cliff along Jefferson Boulevard.I was able to use Housing Department funds to install 100 quality bicycle parking spaces. Jefferson Avenue was chosen because of the high number of immigrant cyclists in the area (who parked their bicycles behind their work places). Bike Racks Downtown and in Deep Ellum: I was able to secure funding to install over 144 bicycle parking spots at minimal expense to the City of Dallas (less than $10,000). Two to a block (mostly inverted U racks), they are painted yellow so cyclists can spot them at a distance, and pedestrians won't walk into them. The Katy Trail Extension from McCommas to White Rock Lake: Using multiple funding sources, I was able to secure funding to use DART and TXU right of way to build a trail extension that goes under Greenville, over Skillman and Abrams, and under Northwest Highway to link the White Rock Trail and DART Station to both the Mockingbird Station and the northern terminus of the Katy Trail. 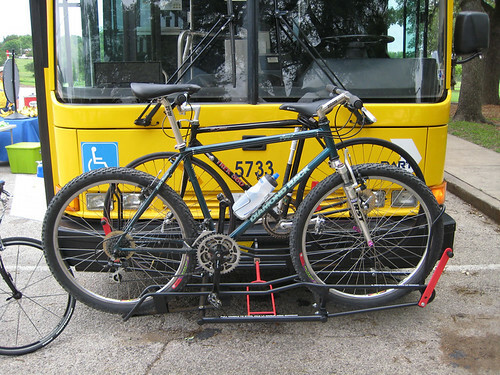 Bike Racks on DART buses: This was a long battle waged on many fronts, with much shaming having to be done to get this accomplished. The results have been surprisingly positive. The East Dallas Veloway: Consisting of the Santa Fe Trail and its future expansion to Royal Lane along the old Union Pacific line, I was able to secure funding from multiple sources (Dallas County, NCTCOG, and TxDOT) to build this trail from White Rock Lake to Expo Park. Working with TBC and Rep. Eddie Bernice Johnson's office, I was able to secure funding to route the trail underneath the DART Green Line. A wording miscue in the authorization resulted in the project's cancellation. I was able to secure the City's matching funds (and expand the funds with bond money) to route the trail east-west from Fair Park to the Baylor/Deep Ellum DART stations. One of the key factors in making the five mile northern extension possible (which will end up being the coolest bike trail in Texas as it soars over traffic lanes and cuts through limestone gorges) was my ability to get DART and the City to not tear down a concrete rail bridge that goes over Skillman Avenue, crossing six lanes of traffic 30 feet in the air. I was able to retain 3/4s of the bridge during a flood control project that planned to demolish the entire bridge. Replacing the 100' span that had to be removed for hydraulics is doable as part of a bike/ped project. Replacing the entire 400' bridge would have been cost prohibitive. Sometimes victory is not defined by what you win, but by what you don't lose. Bicycle Mode Share: In spite of being the only major city in the USA to require mandatory bicycle helmet usage for adults, I was able to see the trip mode share in Dallas double from 2000 to 2010. Still a low number, but one that compares favorably with not just benchmark cities, but also with Austin. Demography, geography, and population density remain the constant defining factors. Bicycle Bans on Public Roads:I successfully argued against two serious attempts to ban bicyclists from the roads around White Rock Lake.